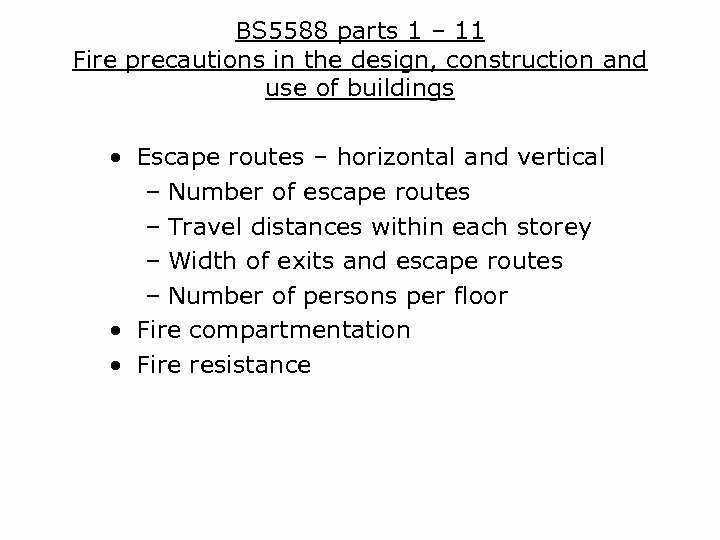 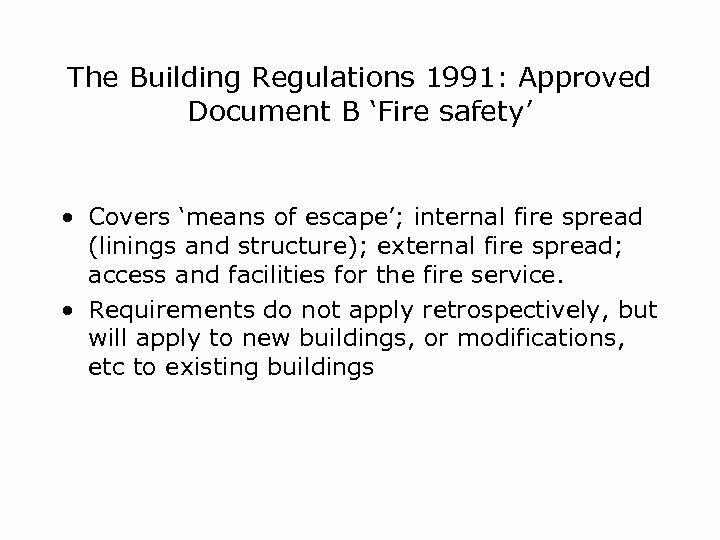 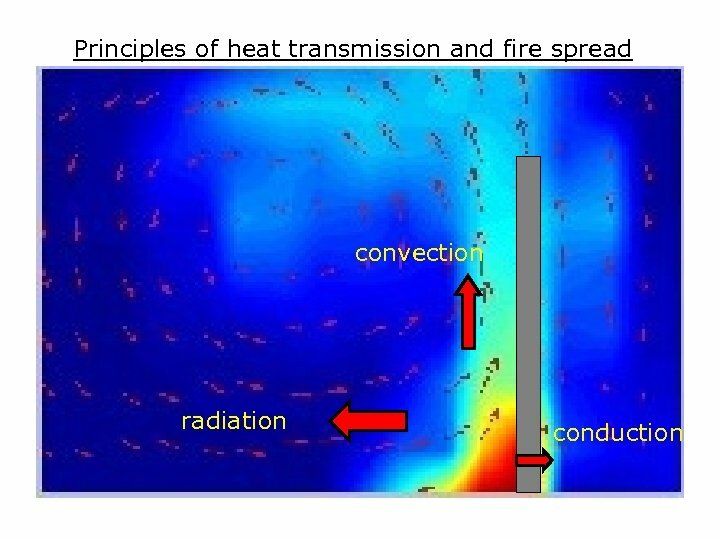 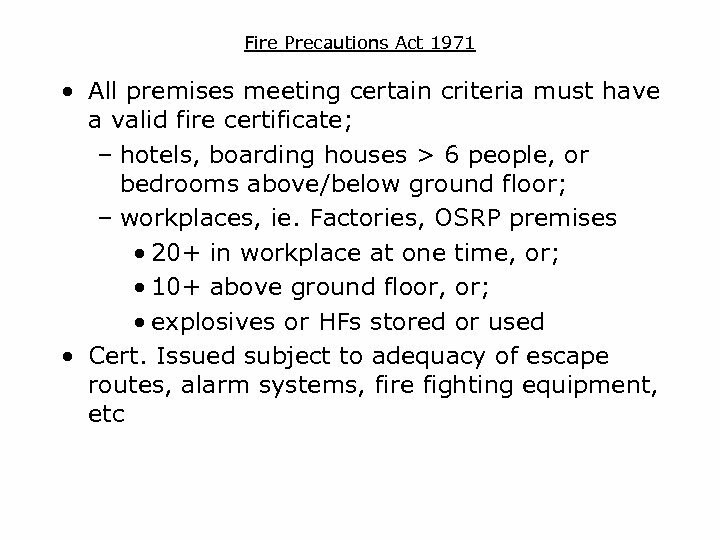 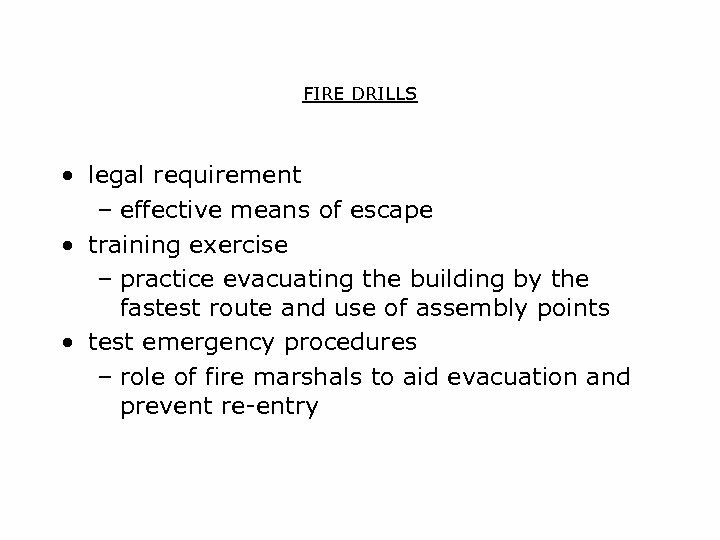 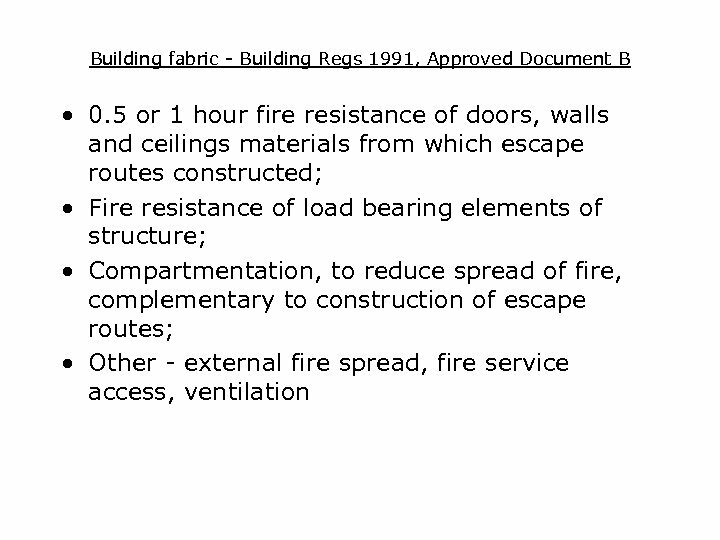 Fire compartmentation in buildings Fire escape route from various rooms are protected. 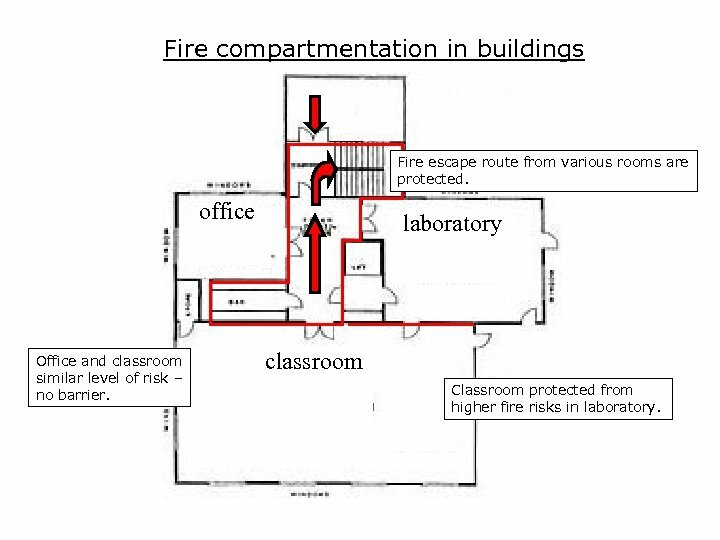 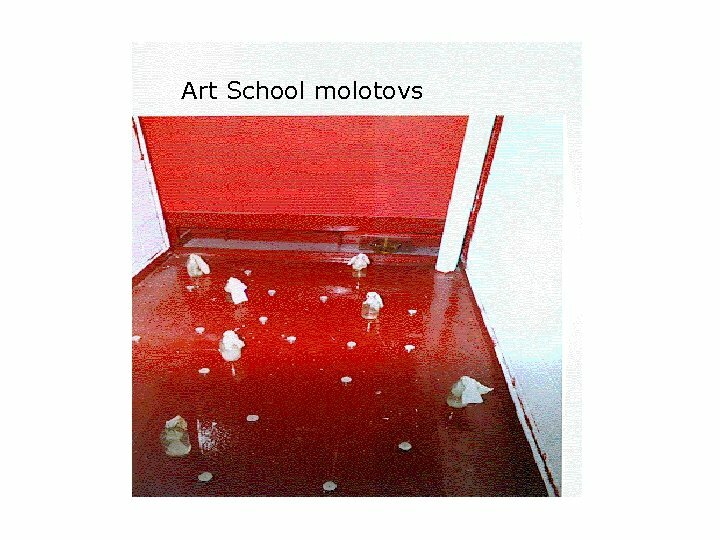 office Office and classroom similar level of risk – no barrier. 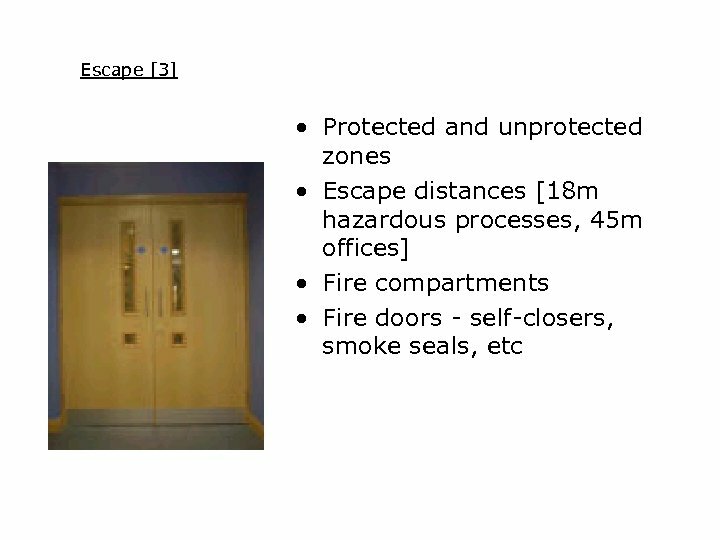 laboratory classroom Classroom protected from higher fire risks in laboratory. 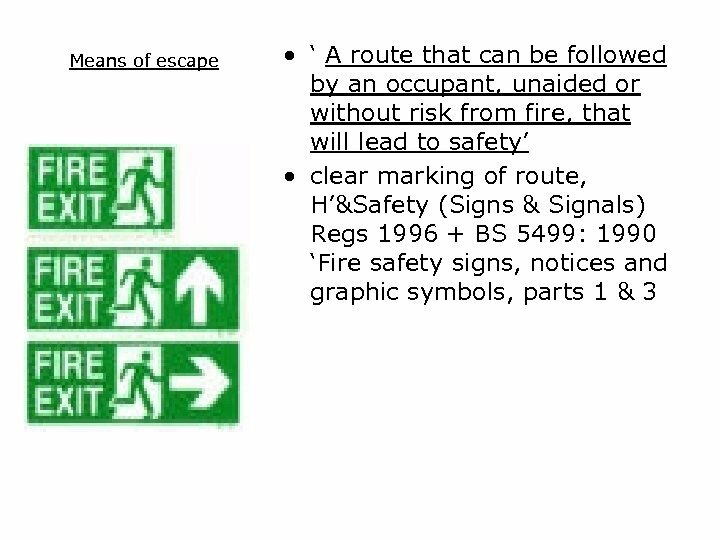 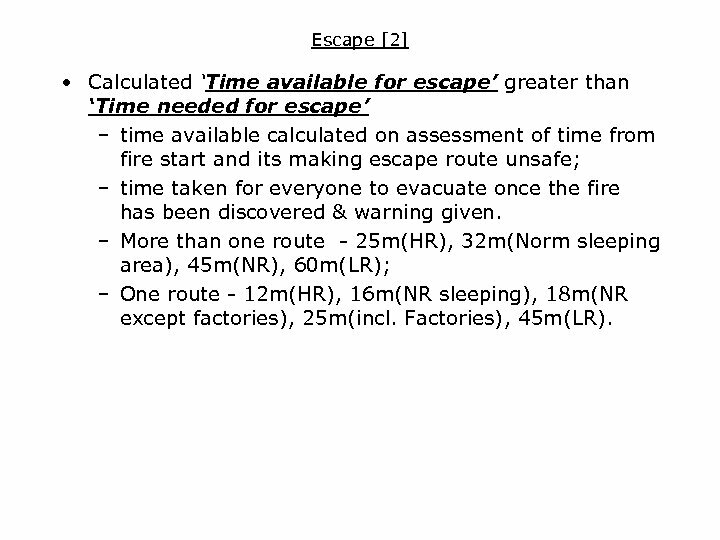 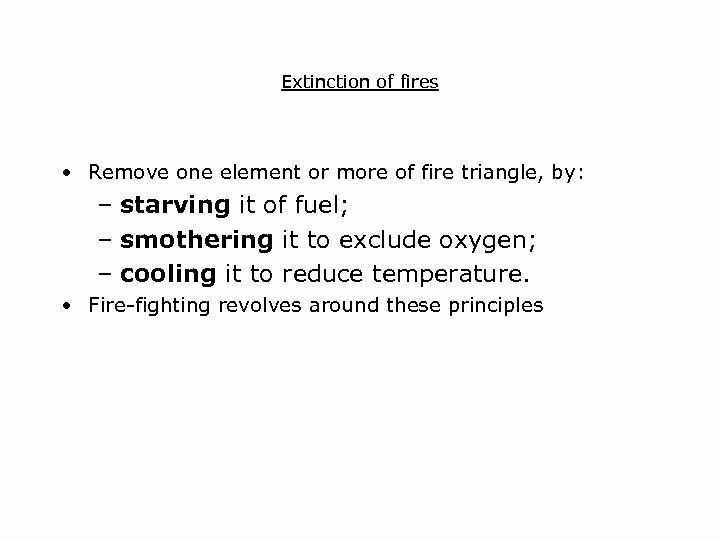 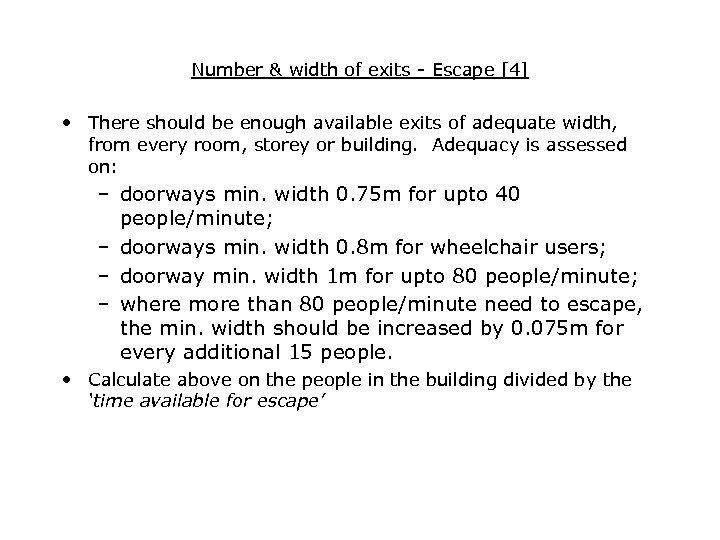 Escape  • Calculated ‘Time available for escape’ greater than ‘Time needed for escape’ – time available calculated on assessment of time from fire start and its making escape route unsafe; – time taken for everyone to evacuate once the fire has been discovered & warning given. 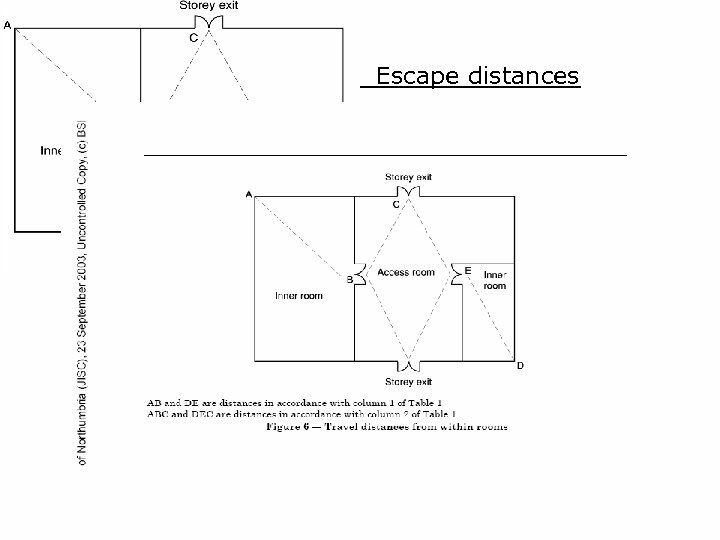 – More than one route - 25 m(HR), 32 m(Norm sleeping area), 45 m(NR), 60 m(LR); – One route - 12 m(HR), 16 m(NR sleeping), 18 m(NR except factories), 25 m(incl. 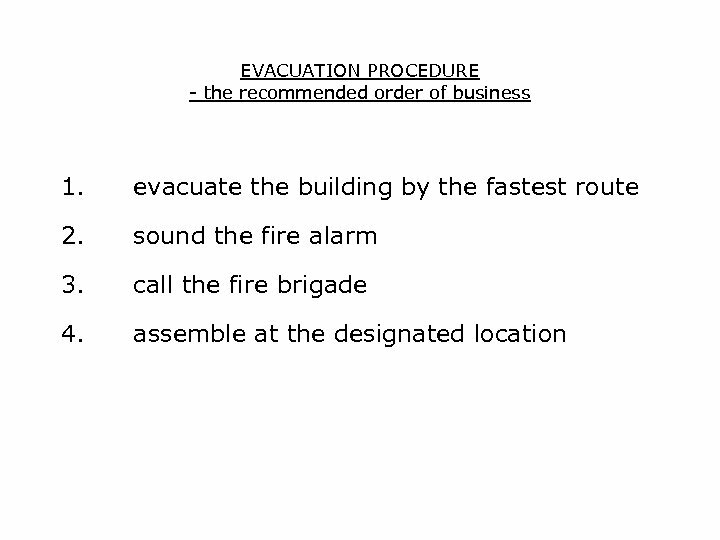 Factories), 45 m(LR). 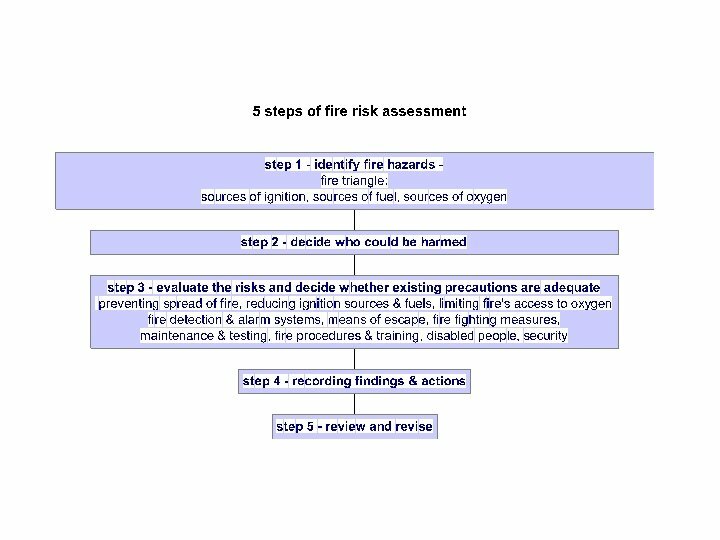 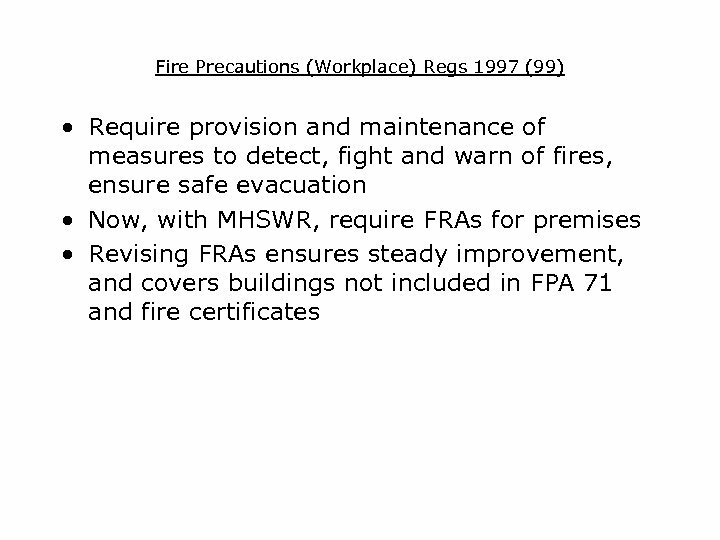 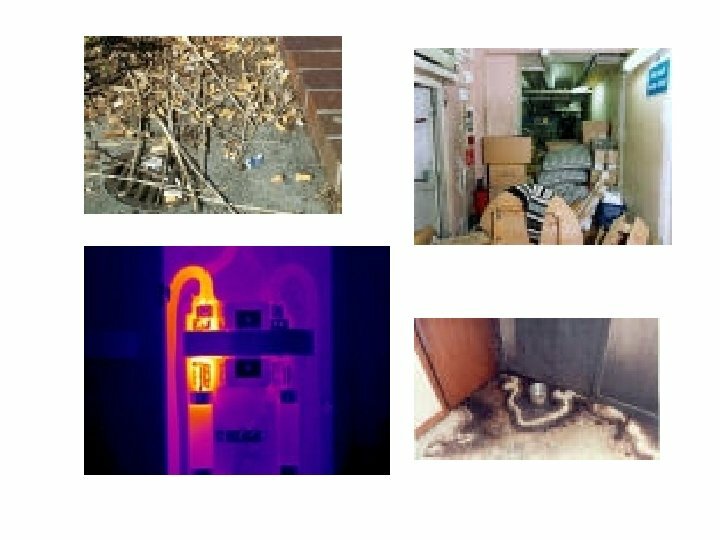 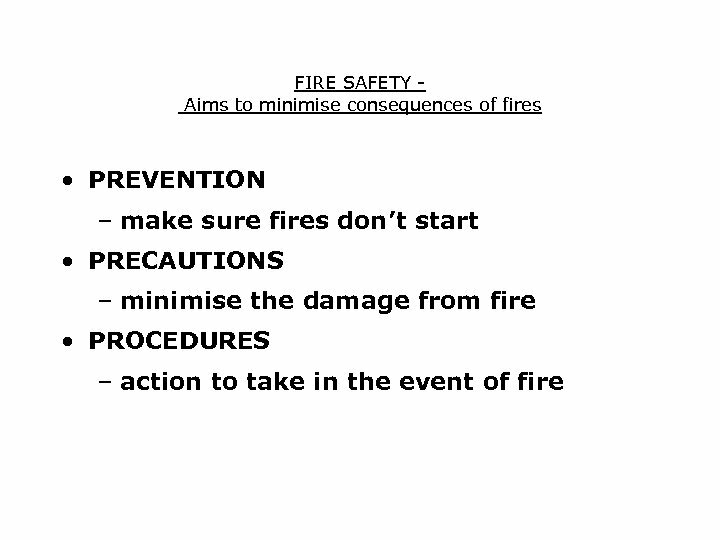 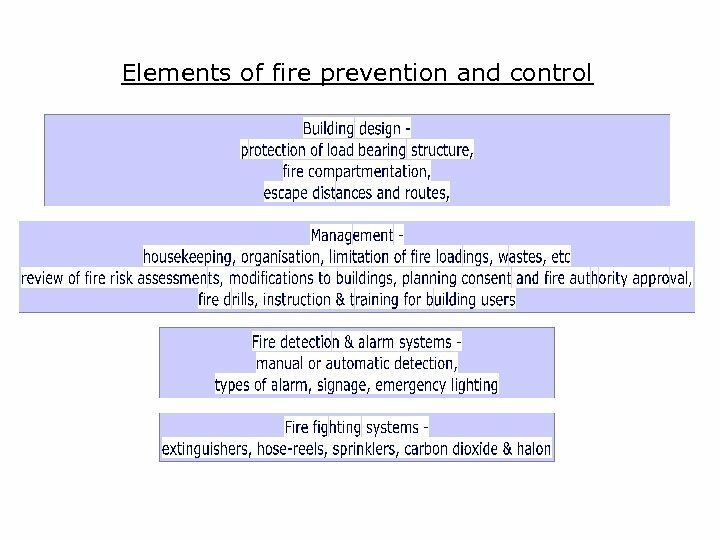 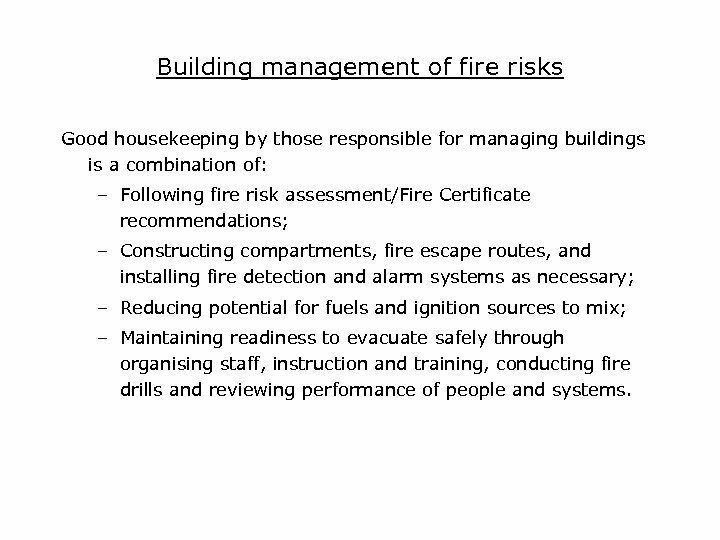 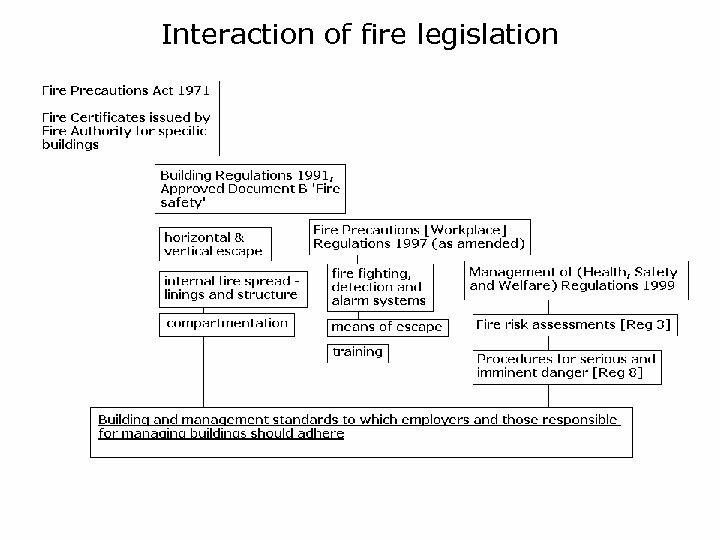 Building management of fire risks Good housekeeping by those responsible for managing buildings is a combination of: – Following fire risk assessment/Fire Certificate recommendations; – Constructing compartments, fire escape routes, and installing fire detection and alarm systems as necessary; – Reducing potential for fuels and ignition sources to mix; – Maintaining readiness to evacuate safely through organising staff, instruction and training, conducting fire drills and reviewing performance of people and systems. 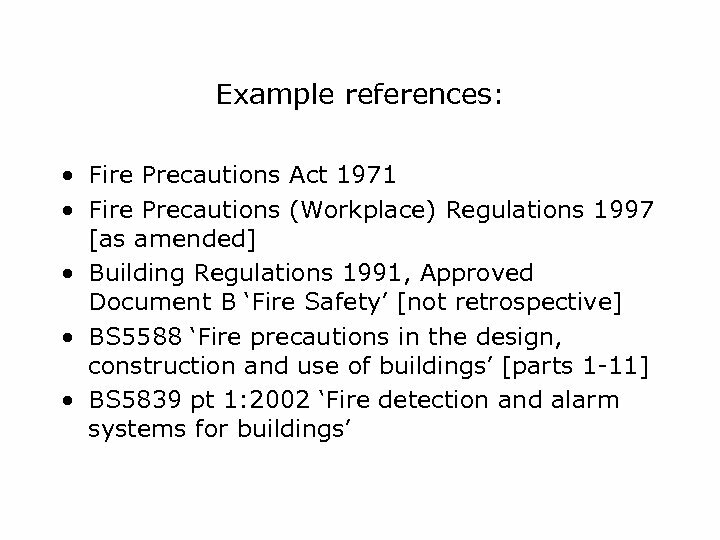 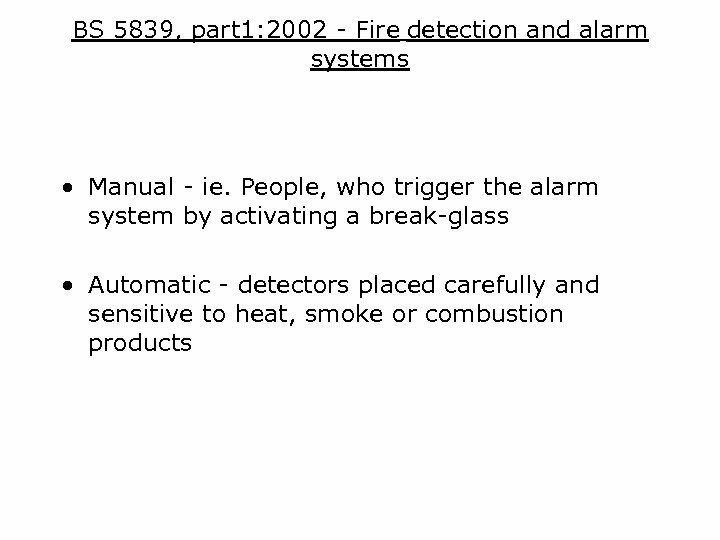 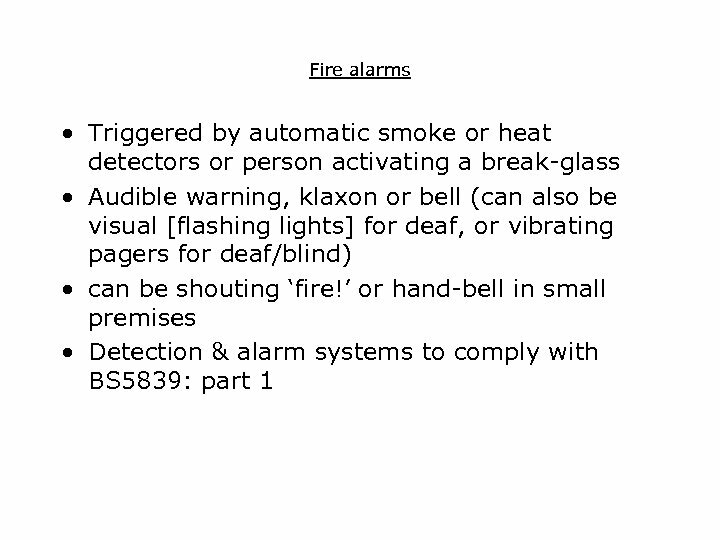 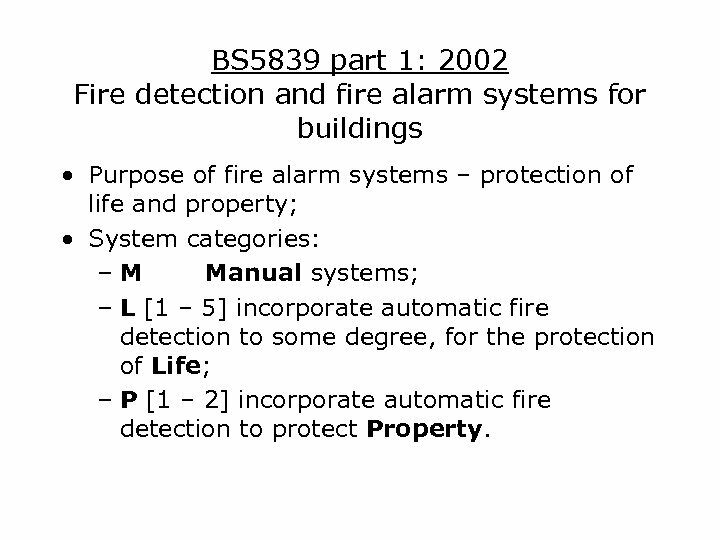 BS 5839 part 1: 2002 Fire detection and fire alarm systems for buildings • Purpose of fire alarm systems – protection of life and property; • System categories: –M Manual systems; – L [1 – 5] incorporate automatic fire detection to some degree, for the protection of Life; – P [1 – 2] incorporate automatic fire detection to protect Property. 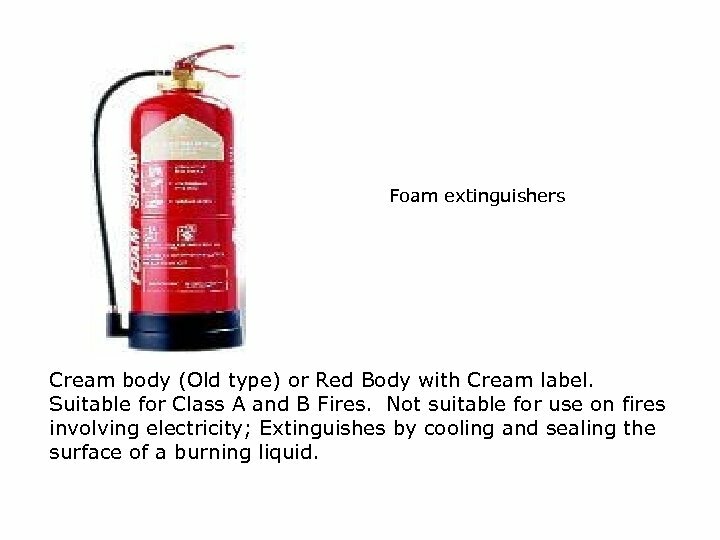 Foam extinguishers Cream body (Old type) or Red Body with Cream label. 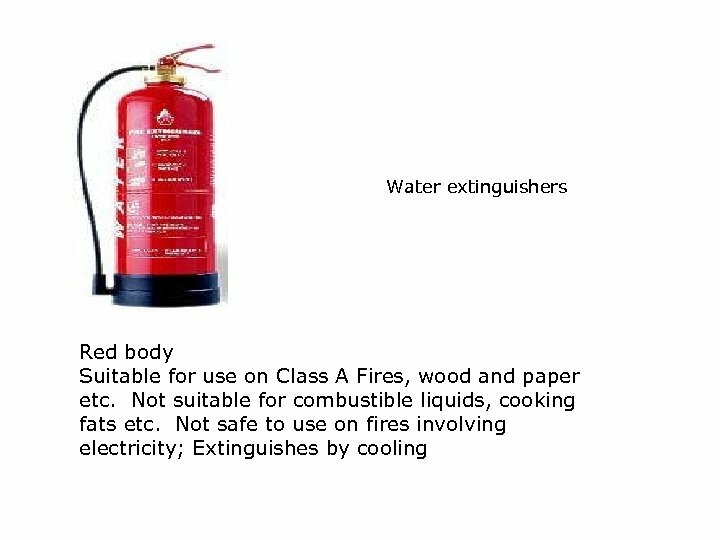 Suitable for Class A and B Fires. 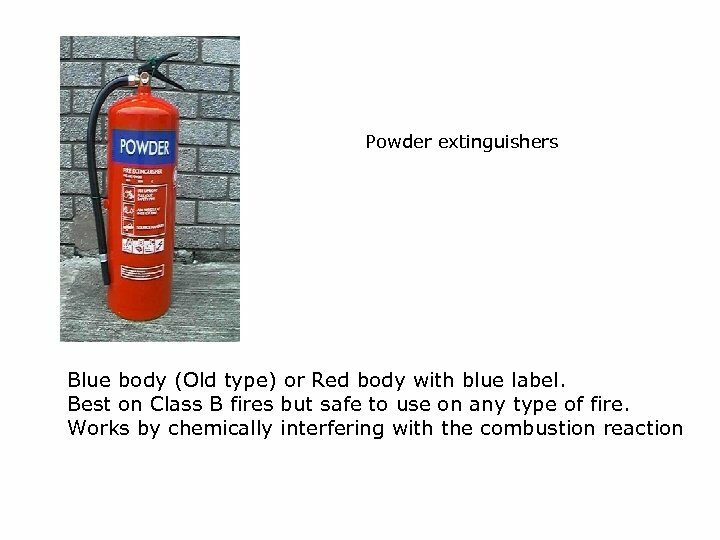 Not suitable for use on fires involving electricity; Extinguishes by cooling and sealing the surface of a burning liquid. 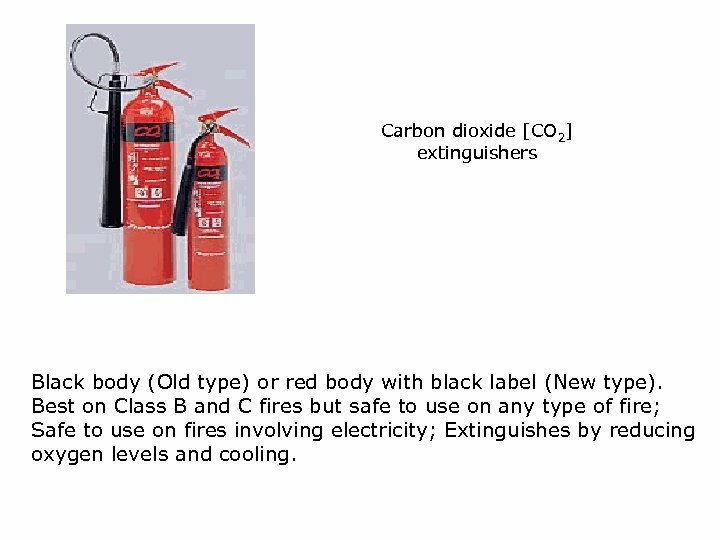 Carbon dioxide [CO 2] extinguishers Black body (Old type) or red body with black label (New type). 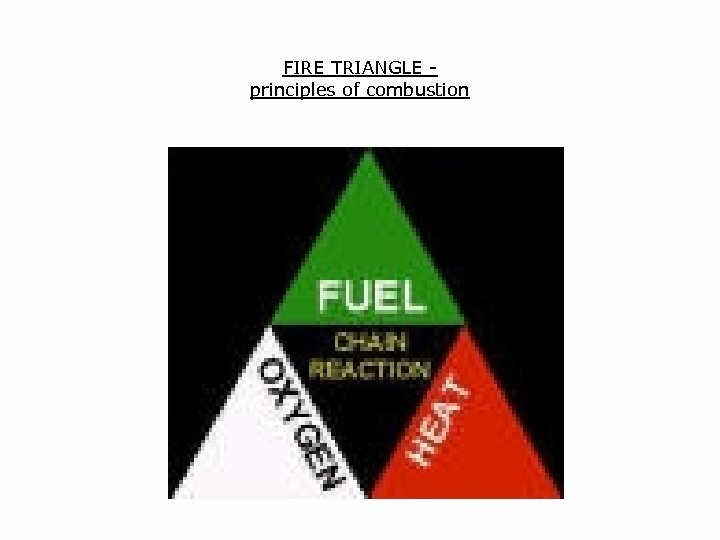 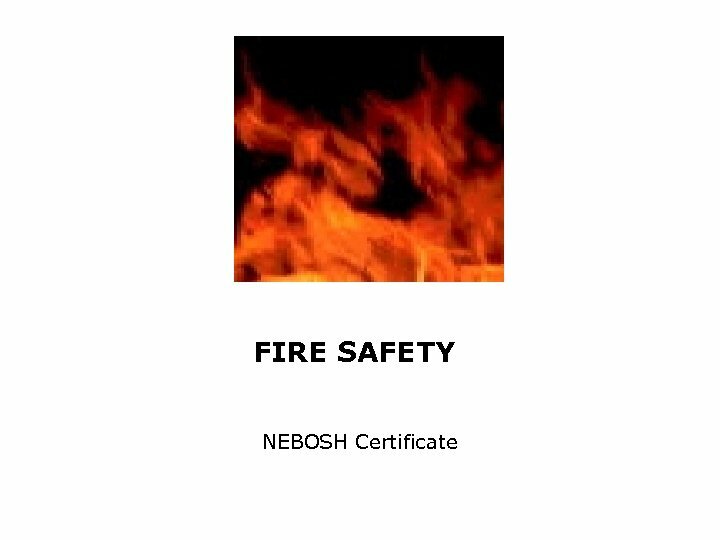 Best on Class B and C fires but safe to use on any type of fire; Safe to use on fires involving electricity; Extinguishes by reducing oxygen levels and cooling. 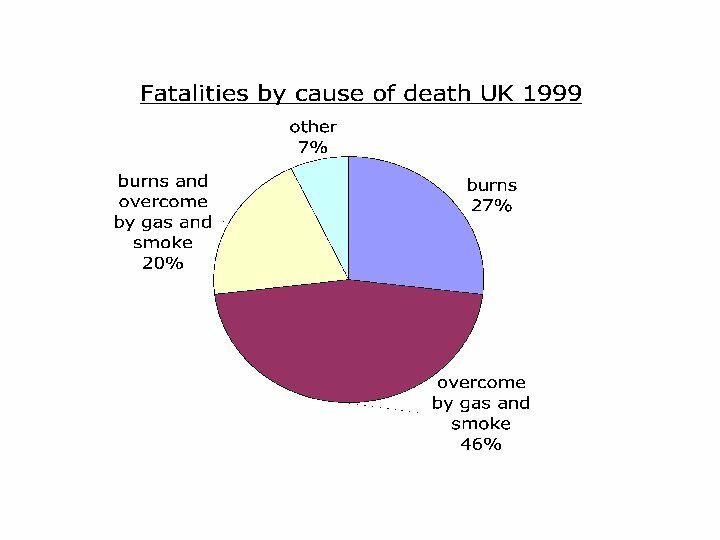 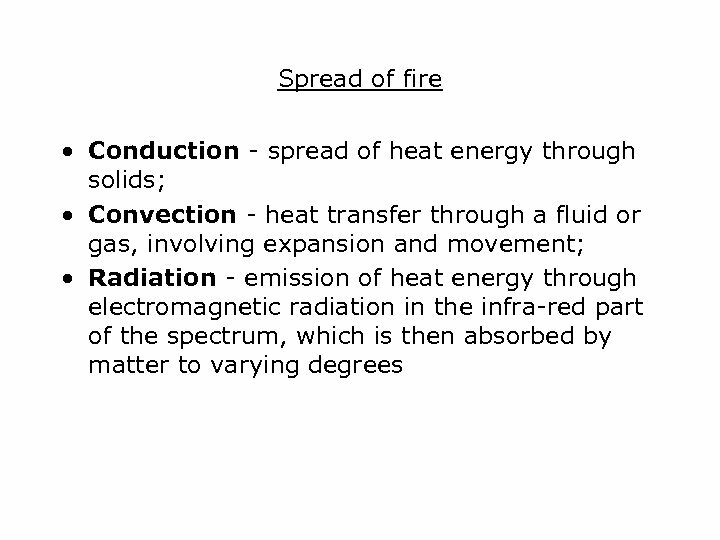 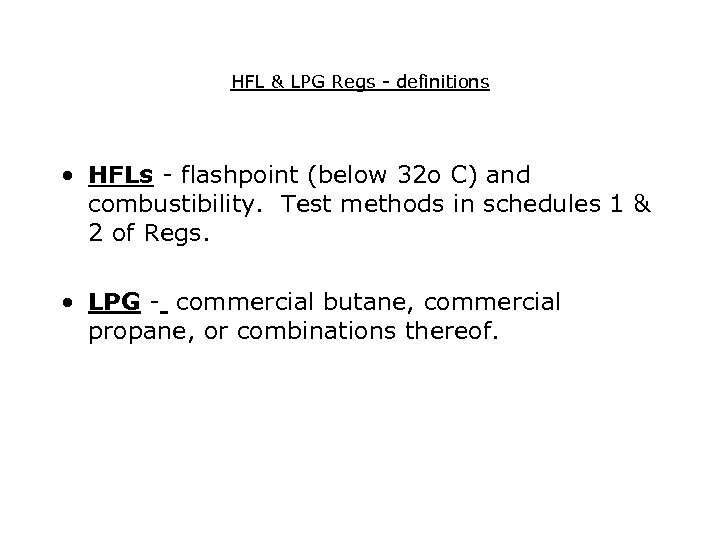 HFL & LPG Regs - definitions • HFLs - flashpoint (below 32 o C) and combustibility. 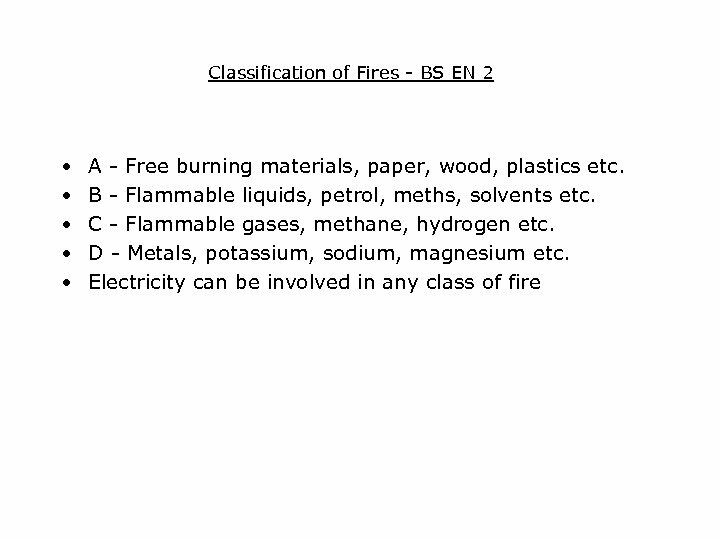 Test methods in schedules 1 & 2 of Regs. 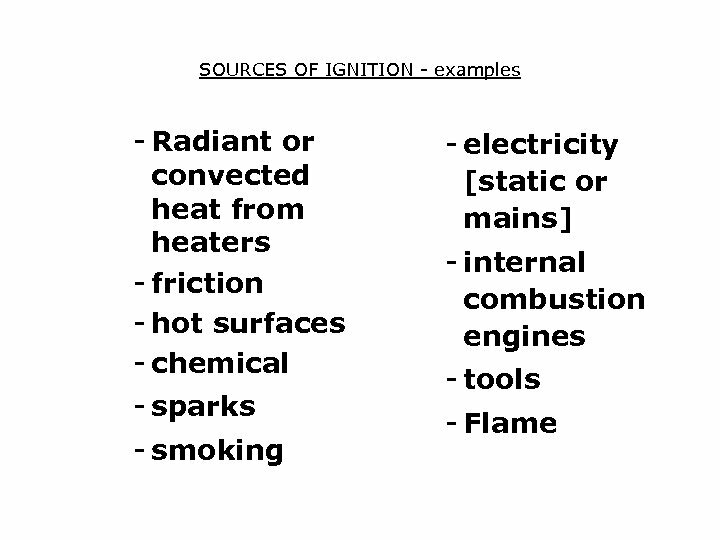 • LPG - commercial butane, commercial propane, or combinations thereof. 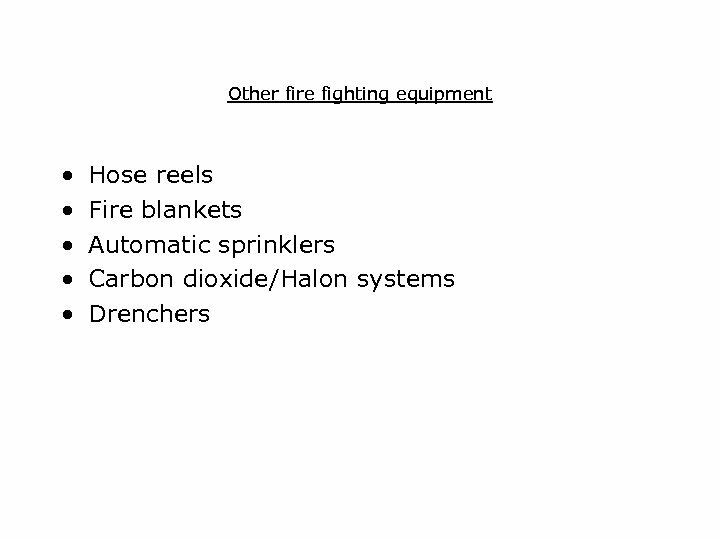 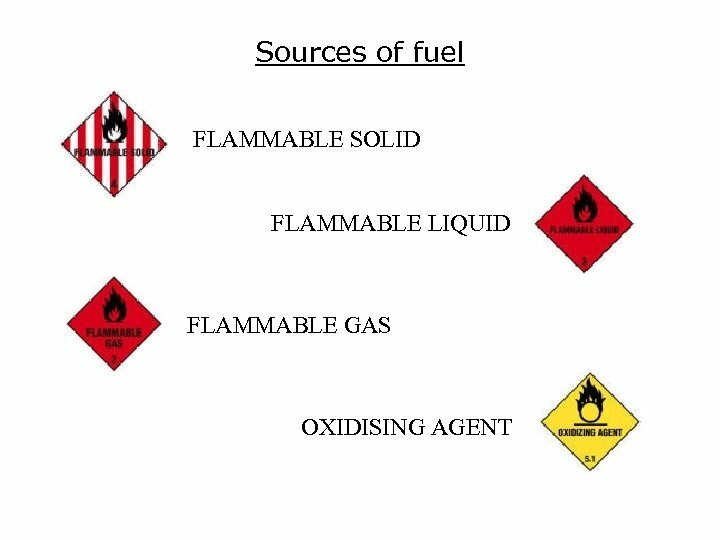 Storage • Suitable fixed storage tanks in safe positions; suitable closed vessels in open air and protected from direct sunlight; or closed vessels in storerooms in safe position or fire resisting structure; or in workroom in fire resisting cupboard which is fire resisting structure. 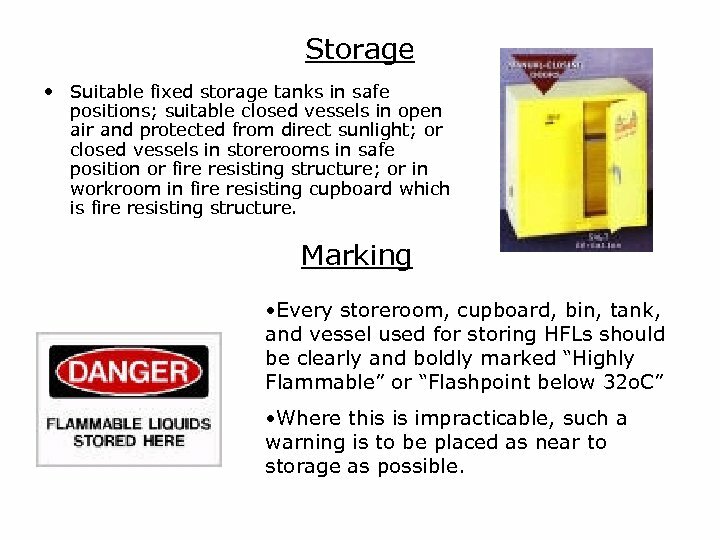 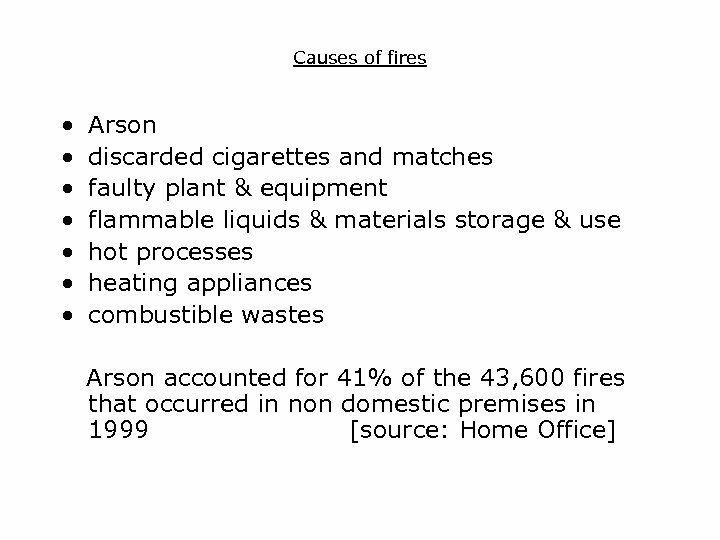 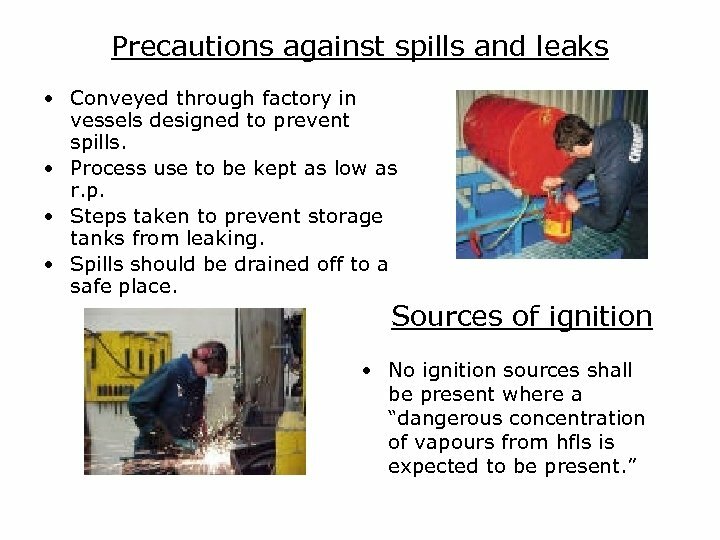 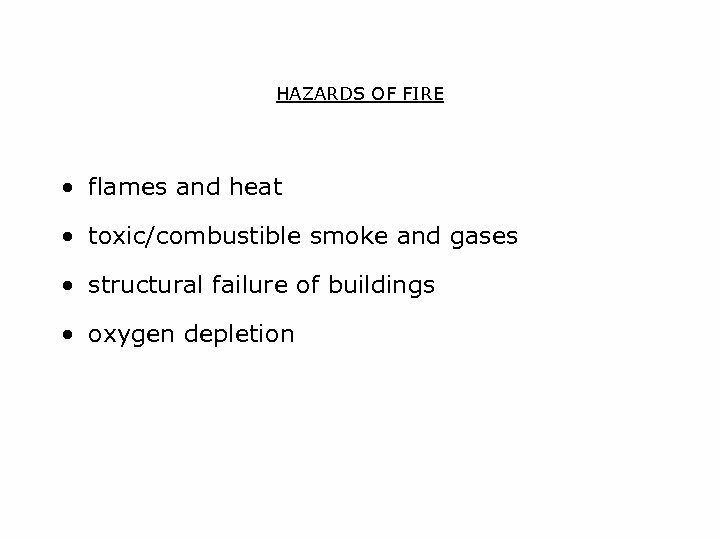 Marking • Every storeroom, cupboard, bin, tank, and vessel used for storing HFLs should be clearly and boldly marked “Highly Flammable” or “Flashpoint below 32 o. C” • Where this is impracticable, such a warning is to be placed as near to storage as possible.